Personal injury problems arise out of many different activities. Automobile accidents are the most obvious. Workers compensation relates to injuries on the job or conditions of employment (e.g., lung conditions from working in dusty areas) that result in a disability. Medical malpractice can cause severe and serious long-term injury. Other personal injuries occur from construction site accidents, from slips/trips and falls on someone else’s property, from fires, from dog bites, and other conditions. Generally, unless the injury was intentionally caused, to recover damages for an injury it is necessary to show negligence by another individual that was the cause of your injury. Three things are necessary: (a) the other individual had a duty to you; (b) the other individual breached his duty to you by doing something that he wasn’t supposed to have done, or else by failing to do what he was supposed to have done; and (c) the breach of duty caused injury to you. In addition to determining whether you can recover damages from another party, your attorney will help to decide the whom, what, when, where questions that arise. Who are the proper parties to sue (one person, two persons, employers, businesses, governmental bodies, etc.)? What information needs to be gathered to prove your case (medical records, accident reports, expert opinions, billing statements, etc.)? When is the time limit for filing suit (depending upon the type of injury, you may have one year, two years, six years, or ten years to file suit)? Where should the case be filed (state court or federal court, district court or circuit court)? Is there a state agency that handles this type of claim, instead of a court? Your attorney will be able to assist in getting all these questions answered and in getting recovery for your injuries. Workers’ compensation is the system designed to ensure that a worker is compensated for injuries on the job, or disabling physical conditions that are caused by the job (e.g., hearing loss). If death occurs, benefits are paid to the dependents of the deceased employee. If you lose a finger, a hand, a foot or other members your body from a specific injury, you may receive benefits, too. It is not necessary that an injured worker prove someone is at fault for the injury. It is sufficient that you show the injury (or condition) arose out of and in the course of employment. If you can show that, and that you have suffered or will continue to suffer a wage loss, then you are entitled to benefits under workers’ compensation. Benefits include medical care for the injury or injured condition, vocational rehabilitation if necessary, and wage loss payments. The amount of the wage loss benefit varies, depending upon one’s income, but it is essentially equal to 80% of the average weekly take-home wage for the injured worker. We are all aware of the Social Security Old-Age Benefit program for those older than 66 years old. There is also a disability program through Social Security that will pay benefits to an individual that becomes disabled from working for any reason. The benefit that is available to the disabled person is, essentially, the amount that would have been payable to him if he had waited until the age of 66 to collect old-age benefits. All of these elements are necessary and important toward proving a disability claim with the Social Security Administration: there must be enough work credits, you must be able to show that you cannot engage in any substantial gainful activity, you must provide medically determinable evidence of physical or mental limitations, and you must be able to show that the condition(s) last or are expected to last for 12 months or more. It can be a confusing and frustrating process to pursue these benefits. In addition, there are other methods of proving disability, but space prevents us from trying to explain those processes and methods. It is best to consult with an attorney who understands these procedures and processes. James O’Reilly has assisted others in buying and selling business entities, as well as organizing corporations, limited liability companies and sole proprietorships. He assists in structuring and organizing the entity, obtaining certifications from the state and federal governments and filing the necessary documents. All contracts associated with the operation of the business are also reviewed. The operation of businesses may also involve the collection of accounts receivable, another activity that Mr. O’Reilly has had extensive experience for more than 30 years. The Fair Debt Collection Act places very strict requirements upon those attempting to collect debts, and Mr. O’Reilly is well-versed in those requirements. The law firm provides assistance in all forms of real estate matters, whether it is residential or commercial property. Everything from due diligence investigation of the property to preparation of purchase agreements, closing documents, review of title work, review of mortgage documentation, preparation of leases or land contracts and recording of necessary documents are part of the services provided. We have assisted in getting liens removed from titles and clearing up ownership disputes. If you lease your residential or commercial property to others, you will, of course, want to have a properly drawn-up lease that protects you or your property. You will want to know if you might have liability for injuries on the premises, or criminal acts of your tenants, and will want to know what duties you will have to your tenants. You will have to become familiar with your responsibilities regarding security deposits if you are going to lease residential property. If you are a tenant, you will need to understand what you can and cannot do on or with the property you lease, and what responsibility you might have regarding a security deposit. You will want to know what you can do if the landlord is not taking care of the property, or is violating the lease, or what can happen if you miss a rent payment or are being evicted. Probate is the process by which our individual assets are distributed or disbursed to our heirs upon our death. If you have a Will, the Court will be given direction about whom you wish to supervise the distribution of your assets (the Personal Representative), to whom you wish to receive those assets and how the assets are to be distributed. If you don’t have a Will, then state law directs whom the Probate Court may appoint to act as Personal Representative, as well as who may claim an interest in the receipt of your assets. Probate Court also sets time limits and directions for when claims or lawsuits may be filed against an estate, who may make a claim and when the estate must be closed. Probate courts are the decision-makers if there is a necessity to appoint a guardian or conservator for an individual that is mentally or physically unable to take care of his/her affairs, or for an individual that is under the age of 18 and either needs legal representation or needs control of his/her financial affairs. The individual that takes care of financial matters is called a Conservator, and the individual that has legal authority over another is called a Guardian. The probate process can be confusing, with the number and type of documents that must be filed, or may be filed, or should or should not be filed, together with what information can be confidentially withheld. The probate process is one area where you might need the assistance and direction of a lawyer that is familiar with the process. Almost every person has, or wants, an estate (a savings account, a house, an insurance policy, stocks, a pension, etc.). This serves as security for that person and his or her family during the lifetime, and for the family after death. 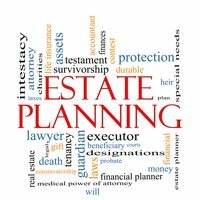 Estate planning involves the preparation of your estate, and what will happen to it if you become disabled or incapacitated, or if you die. It centers upon the preparation of a Last Will (at a minimum), a Power of Attorney (if you become disabled and cannot take care of your affairs while alive), a Health Care Power of Attorney (if the situation arises that life and death decisions have to be made) and possibly a Trust. The Last Will identifies the individual that will supervise distribution of your assets after you die, who will receive those assets, whether any gifts should be made, who might be the guardian for your minor children, where you might be buried or whether you wish to be cremated, etc. A Power of Attorney gives authority to another individual to take care of your affairs (banking, payment of bills, signing of checks, file tax returns, etc.). This person acts in the same manner as a Guardian or Conservator, but doesn’t require any supervision or control by the probate court. You can have a Power of Attorney not only if you become unable to take care of your affairs because of disability, but also because you are absent on a trip or vacation or whatever. A Power of Attorney is an important document, because, statistically, 1 of every 6 people go through a period of disability that lasts more than 30 days, and it always more reassuring if you can appoint someone to take care of your affairs, rather than having a Probate Judge make that decision for you. The Power of Attorney for Health Care is a specific document that only becomes effective when you are unable to make decisions regarding medical care or treatment. It appoints an individual to make those decisions for you if you cannot, whether it is because you are physically or mentally incapacitated. This appointed individual may even need to make decisions that would effect whether you live or die! A Trust is a fairly complex document that is often effective both before and after death, and whether an individual is disabled or not disabled. It is most often prepared when individuals have substantial assets, but is frequently used to (a) avoid having one’s estate go through Probate court; or (b) limit the amount of taxes someone might have to pay upon death; or (c) prevent creditors from getting access to an individuals assets; or (d) keep assets out of the hands of unreliable relatives or irresponsible children. Each person’s situation is different and may not require one or more of the documents identified, above. But if you are concerned about what will happen to your estate if you become disabled, or when you pass away, a thorough discussion with a competent lawyer is in order, to address those concerns and protect your assets. Someone owes you money, but you don’t know how to collect it. You filed a lawsuit, and got a judgment on your own, but the Court tells you that they can’t advise you how to go about collecting on the judgment. What do you do? Fortunately, there are avenues to pursue and procedures to follow that might get you the money that is owed. We have had extensive experience pursuing the deadbeats that haven’t paid you. We can help you garnishee their wages if they are employed, or get money out of their bank account, or put a lien on their house, or get their tax refund sent to you. Call us to find out if we can finally put money in your pocket that should have been there a long time ago. There are very few things in life that are more upsetting than getting arrested. What do you do? What do you say? What can they do to you? Am I going to jail? Will I lose my life savings paying for this? Where do I go from here? You may be charged with a serious crime, you may be charged with a misdemeanor, you may be charged with a traffic offense, it doesn’t matter. There are going to be consequences for the arrest, whether you are innocent or guilty. It will be in the front of your mind until it is resolved. It may even cost you freedom for some period of time. You will need to talk to an attorney, if not retain that attorney, to discuss the facts, possible consequences of a conviction, and a course of action. Do I have to tell my employer about this? Will this effect my ability to get a job? Can I lose my job over this? Can I lose my benefits (Social Secuity, food stamps, etc.)? Any offense in the category of criminal sexual conduct will have very serious consequences, especially if required to register with the state for the next 15 years! It is essential that these possibilities and others be discussed with an attorney before any desire to plead guilty to any offense is considered.